The Punjab SSSB advertised about the vacant seats amid in the gone last year. Candidates those completed the online process of the application must grab Punjab Clerk, Computer Operator (CO), Steno-typist, Jr. Scale Steno Roll Number from www.punjabsssb.gov.in. According to the updates coming out, admit cards for the PSSSB’s spoken posts will be uploaded in a prompt manner. In the meantime, applicants can polish their knowledge by opting the Exam syllabus and structure herein. Here’s to inform you the Two (2) Hours duration of the written test is having two sections i.e. A & B. In each section, there shall be 50 questions and a penalty of 0.25 marks is applicable for the wrong answer. You may know more about the subject, topics for JSS, Steno 2019 Exams from this underlined link. After a REALLY long wait, PSSSB is FINALLY going to conduct the competitive exam for Stenotypist and J.S.S posts in the fourth week of this month. As the board has finalized the timetable now it will process the candidate’s admit card on the above-mentioned date. 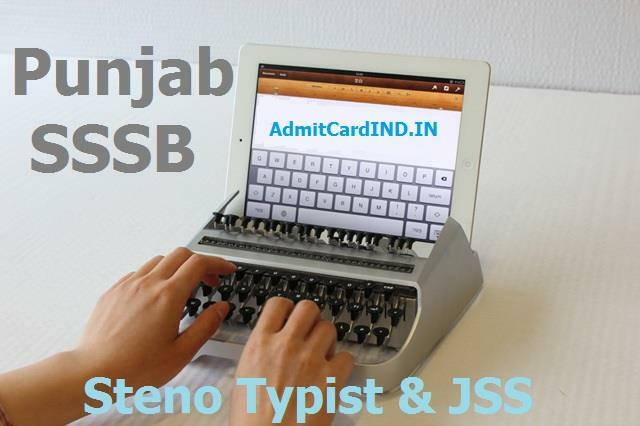 Make certain that you will need to validate the registration number, password or date of birth while taking out the Punjab Steno/JSS 2019 admit card. So, Keep that along with you. For the miscellaneous info i.e. about the venue location, roll no, reporting time, and so on; candidates will have to refer the PSSSB 2019 Admit Card. Also, an original e-admit card has to be brought at the venue conjointly with original ID proof and photocopy of the same for being compliant in the verification process. Apart from this, All of the attendees are requested to patiently check the instructions given on the Punjab SSSB admit card to avoid any mishappening at the examination hall. Below are some easy steps that you may want to check for downloading the exam call letter. Here, in the current news, you should be able to see the “PSSSB admit card notice of Stenotypist or JSS” (if available). After you click on this, it would show a login page where the details regarding your application to be filled appropriately. Thereupon, Just submit to move ahead. Within a few moments, the admit card/roll no will show up for display and printing purpose. Note here: Till now only the exam date is out, PSSSB admit card 2019 for the said posts is yet to release. Kindly bookmark this page for upcoming news and notifications on SSSB Exams.